Ademoj Event Centre, Isheri, Alimosho LGA, Lagos – In the spirit of Christmas, Flames Initiative, an international NGO, successfully organized CINTA Project, a widow-empowerment program, last week, in Lagos. The memorable event which was sponsored by Nestle Nigeria, GBF, McPeens, Kingsword International Church, Igando, Eltee Production Company, 54 Artistry, Citimax Pharmacy and others, had about 100 widows in attendance with their children and other guests including sponsors, media professionals and vendors. In addition to a free medical check-up, the widows went home with free drugs, food items, school bags for their children, goody bags, and other packages that can make their Christmas really merry. The happy widows did not disappoint on the dance floor as they moved and glided to some melodious tunes. During a question and answer session, she tackled sexual molestation, emotional pain, child abuse, financial challenges and other issues bothering the widows and their children. 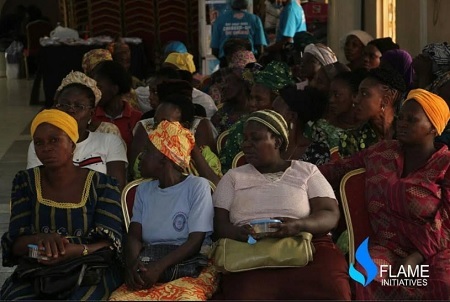 She also encouraged the widows to speak out about their challenges and for the organizers to mediate between the widows and human rights groups. A high point of the event was the prayer session when a man of God showered fervent prayers on the widows. The widows who obviously know they have no one else to turn to but God chorused a thunderous amen to the prayers. An attendee even acknowledged that this was one of the best moments of the event, “They really need those prayers,” he said. The widows went home full of smiles, thanking Flames Initiative for showing love to them in a practical way. This event would not have been successful without support from sponsors and volunteers. It is also open to your support and sponsorship. You can now order Dangote cement in unit or truck load online and get it delivered to your preferred door-step or construction site which is far better than driving from one depot or dealers shop to another .distribute directly from Obajana Cement Plant (OCP) to all part of the country to Sub- distributors, Wholesalers, Retailers and End- users at an Affordable price of N1,300 per Bag. Delivery is guaranteed within 48HRS after booking. Call The Marketing Manager (Sir Jubril Abubakar) on O7O166O706O FOR BOOKINGS AND ENQUIRIES.